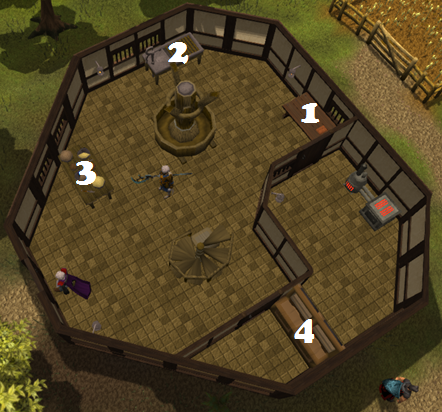 The Cooks' Guild, also known as the Cooking Guild, is essentially a large windmill located to the west of Varrock, and east of the Barbarian Village. It offers a number of perks for chefs, including a wheat field and grain hopper, dairy churn, a bank, and various cooking tools and items. Use a Necklace of Skills (enchanted Dragonstone Necklace) to teleport directly to the Cooks' Guild. This is the fastest way, although a Necklace of Skills is rather expensive. 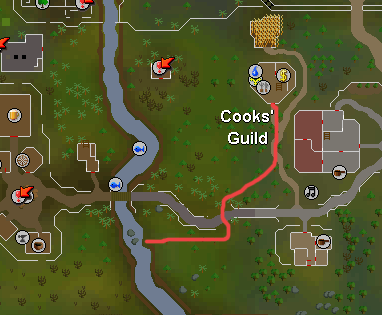 The second best way to get to the Cooks' Guild is by teleporting to Varrock, and then walking west to the Guild. 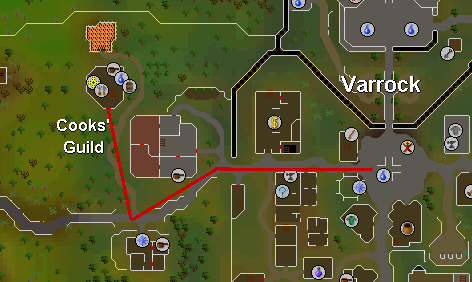 To teleport to Varrock, you will need a Law Rune, Fire Rune and three Air Runes. You could always use a corresponding staff to take the place of the air or fire runes. 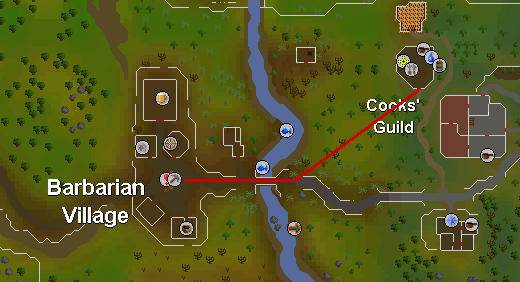 Another way of getting to the Cooks' Guild is by using a Skull Sceptre to teleport to the Barbarian Village, and then walking east. You can obtain a Skull Sceptre by killing selected monsters in the Stonghold of Security Activity. 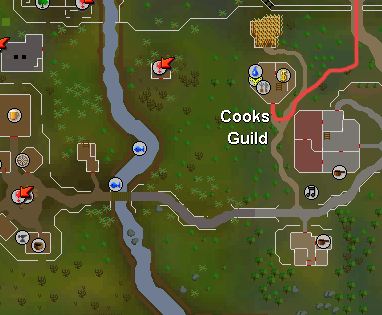 The fourth method to get to the Cooks' Guild is by using Paddewa Teleport (level 54 Magic and completion of the quest Desert Treasure required) to the Edgeville Dungeon. To use Paddewa Teleport, you will need two Law Runes, one Air Rune and one Fire Rune. You should be at the westernmost side of the Edgeville Dungeon. The fastest way is to go all the way through the dungeon. To do that, just go north and follow the path, past the skeletons, zombies and hobgoblins. If you already have a Brass Key, just go up the ladder between the zombies and hill giants. You should be just a little west of the Cooks' Guild. If you don't have a Brass Key, follow the steps above and just pick up a Brass Key in a small cove just north of the Hill Giants. The fifth method of reaching the guild is by using Spirit Trees. 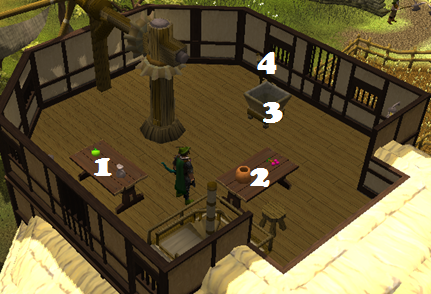 Simply have the main Spirit Tree (located in the Tree Gnome Village) teleport you to the Grand Exchange. From there, simple travel a short distance southwest to the Cooking Guild. Another method of reaching the cooking guild is by Canoe. Build a canoe at any Canoe Station, and take the canoe to Barbarian Village. The guild is a short walk northeast from the drop off point. Additionally, if you are a member with level 99 Cooking, talk to him to buy a Skillcape of Cooking for 99,000 coins. The second NPC in the Cooks' Guild is Romily Weaklax, the pie seller. Romily is Members' only. His pie shop is explained later on in the guide. If you bring Cakes to the Cooks' Guild and have level 50 Cooking, you can turn them into Chocolate Cakes. The pump and drain replace the former sink, allowing you to fill jugs with water to make cooking items, such as wine and pastry dough. Romily sells various pies, from Redberry to Mud to Summer. If you forget a recipe for a certain pie, you can buy a Pie Recipe Book from Romily for the small price of 5 gp. Additionally, you can talk to Romily and he will place an order with you for a certain amount of pies. When you make and deliver them, Romily will pay you. This bank functions as any other bank, though it can be accessed only be members. The bank's proximity to the range makes this a convenient place to train cooking. These two objects are the products of the most commonly produced food in the Cooks' Guild: apple pie. Apple pie is made by adding pastry dough to a pie dish to form a pie shell, then adding a cooking apple to make an uncooked apple pie. As the name suggests, bowls can be filled with water for use in making pastry dough. Cake tins, predictably, are used in making cakes, as pie dishes are used in making pies. With this useful equipment, members can make their very own butter, cheese and cream. Simply use a bucket of milk with the dairy churn and select the one you want to make. Here, another cooking apple respawns, in case someone else grabbed the ones on the second floor. Additionally, the jug that respawns here is used for the making of wine. The pot is used in the production of flour, which will be explained later on. The grapes, like the jug, are used for producing wine. If you have level 35 Cooking, to make wine, simply go downstairs to the pump and drain and fill your jug with water, making a jug of water. Then, use the grapes with the jug of wine and you will have unfermented wine. After 15 seconds, your wine will ferment and will either become a jug of wine or a jug of bad wine. The hopper is the first mechanical step in making Flour. After the grain is in the hopper, simply operate the hopper controls. This will mill the grain and it will slide down a chute to the bottom floor of the Cooks' Guild, where you can collect it with a pot. With Jagex's update to Varrock on May 29, 2007, the Cooks' Guild gained its most useful aspect yet: its own Wheatfield. Previously, cooks wishing to make Apple Pies were forced to pick wheat from near the Champions' Guild, or work with banked wheat. 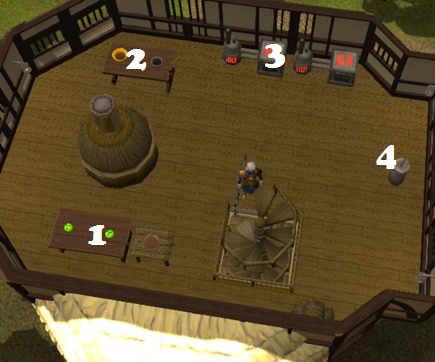 The update changed all of that when visitors to the Cooks' Guild found that they could collect and mill wheat without ever leaving the Cooks' Guild's grounds. This, in turn, made the making of the Guild's most popular recipe, Apple Pie, much quicker. The Wheatfield is located directly to the north of the Guild. 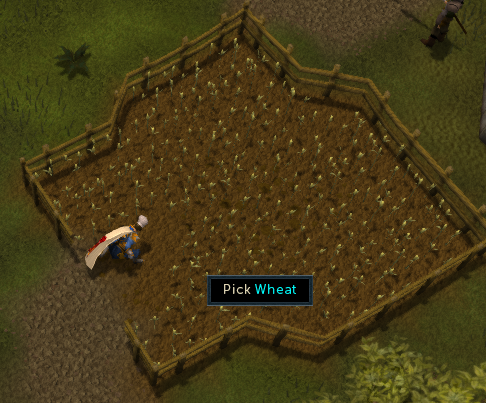 It's not as big as some Wheatfields, such as the ones in Draynor Village or near the Champions' Guild, but the wheat respawns fast enough that you shouldn't have a problem getting as much as you need. As with all wheat fields, there's a possibility that a Crop Circle will randomly appear. This phenomenon will give you access to the Activity Impetuous Impulses.